Lilly wrote: This thread will serve as a reference for those who are interested in the extremely cool furnishings of Mick's loft. As we identify items, we'll try to update that info here. Feel free to post questions or any additional info you might have here. I just got my order of these two magnifying lenses from Amazon. I got them at a great price last month of $154 each as they had them marked down 30% off....but now they are back up too $225 each. Anyway I'm enjoying them and am hunting for the best place to display them as my first intended spot is too small...they look HUGE there. Congratulations, Kathy! 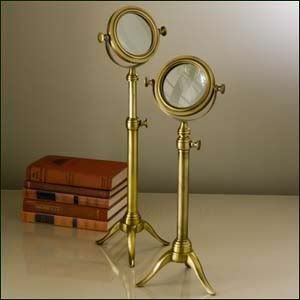 Those magnifiers were always one of my favorite items on the set. Funny thing is I'm waiting for my family's feed back when they see them...their so BIG they can't miss 'em! They'll be making my room well padded at the loony-bin for sure. Except for my youngest niece Hannah. She's a fan of Mick and Moonlight and I can hardly wait to see her face when she recognizes that her Aunt has yet another piece of Moonlight memorabilia. Awesome, Kath! I've held one of those lenses in my hands, and they are HEAVY and yes, very big! But aren't they gorgeous?! Congratulations on getting such a good deal on them! Watching the new Fox show Backstrom, starring Rainn Wilson--and he's got Mick's dining room chairs! allegrita wrote: Watching the new Fox show Backstrom, starring Rainn Wilson--and he's got Mick's dining room chairs! HA! yeah I noticed them too. Darn - I more listened to Backstrom as I was doing something else and didn't see them. Wouldn't it be cool if they were the chairs from ML? Do we know if it was produced by WB? 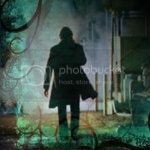 r1015bill wrote: Darn - I more listened to Backstrom as I was doing something else and didn't see them. I doubt they are "the chairs" from ML as this is filmed in Vancouver, British Columbia, Canada (Vancouver area) and produced by 20th Century Fox Television, Far Field Productions and SoulPancake Productions. Ah! It was a nice dream though. r1015bill wrote: Ah! It was a nice dream though. No, no it's not. Because MICK'S chairs are still sitting right where they belong--in the FoS. Scroll down. A little expensive, but I sure would like one!